It started with Layla asking : “Nico, with your research on veganism and fitness, have you heard of Aquafaba?“. Me: “Never heard of it“. 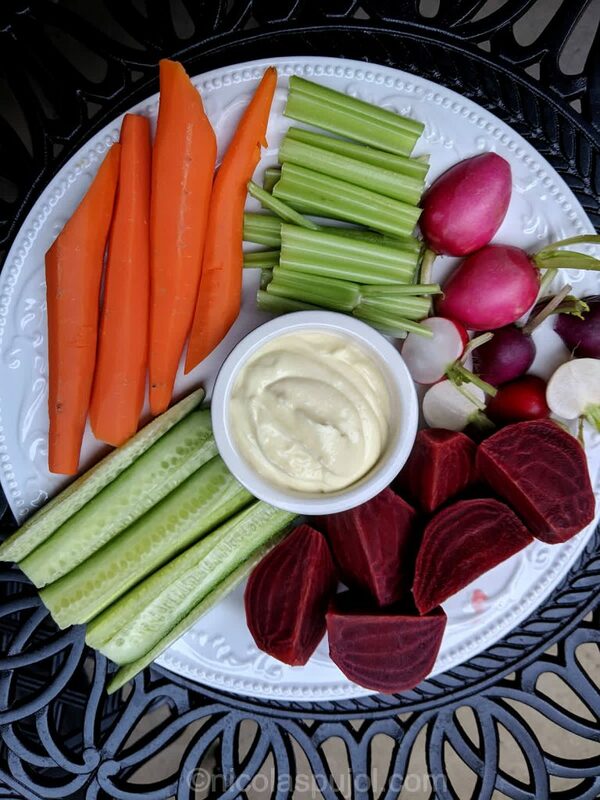 A few minutes later, we had this vegan aioli and were in disbelief about how good it is tastes. 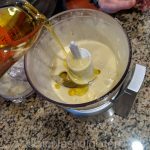 In particular, we were stunned how close it tastes to the traditional aioli we make with eggs by hand, or in the blender. I sometimes call myself part time vegan, because it makes logical sense to eat a plant-based diet. Fewer animals suffer, and from a fitness standpoint, a plant-based diet that is well thought out (i.e. which avoids deficiencies in essential nutrients) is ideal. Animal products tend to contain lots of saturared fats, hormones the animals are fed – we eat them, as well as the carcinogenic risks present in eating too much red meat, or too much dairy (in particular, from casein and lactose). But part time vegan means there are exceptions: a little bit of high quality butter is probably not too bad. 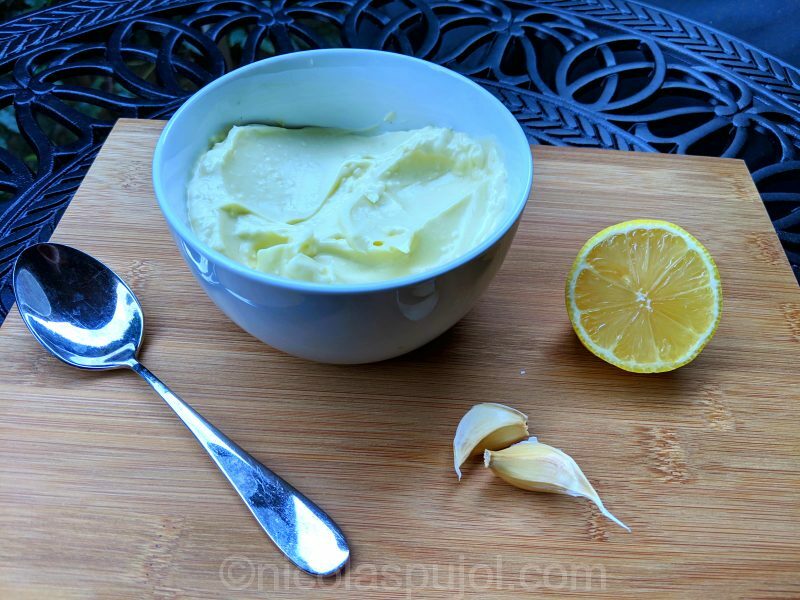 Butter contains, as it turns out, almost no casein and no lactose. Eggs also contain essential amino acids, vitamin D and other nutrients which are hard to find in other foods. They are a very high quality animal product, even if, at its core, an egg. 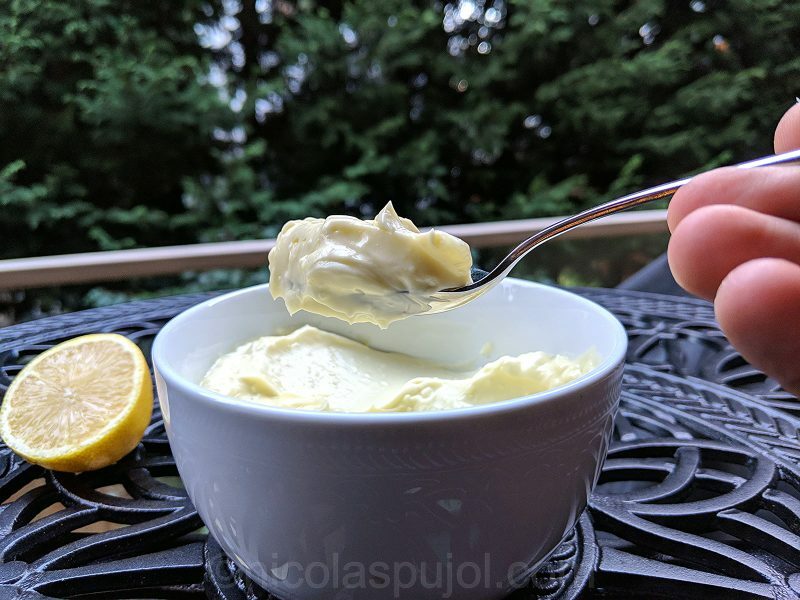 Long story short: the traditional aioli, using garlic and olive oil, and eggs, likely won’t hurt you if you consume it in moderation, and at the same time, will provide lots of essential nutrients from this egg. 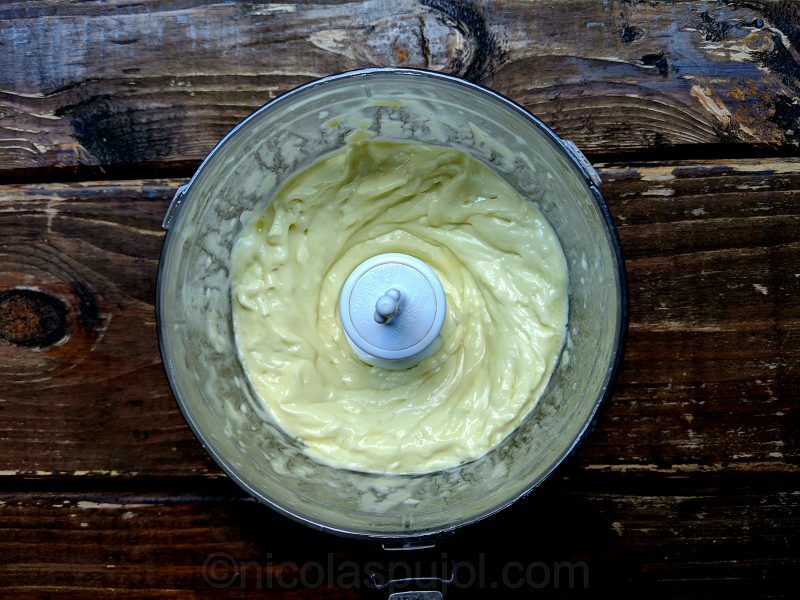 But this recipe is the egg-free aioli version, something I doubted would be possible. One problem with transforming a regular dish which includes animal products into a vegan version, is that it often loses its flavor and nutritional value. As the Germans say, you chase a devil with another devil. By trying to “make it better” by removing something, you may add something else which is just as bad, if nor worse. 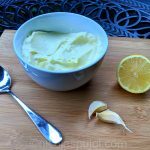 But this is not the case with this vegan aioli, as we are replacing the egg with a high quality vegan alternative: Aquafaba. So what is acquafaba? The easiest way to obtain acquafaba is to open a can of garbanzo beans. Reserve the beans and isolate the liquid residue. This residue is the water which was used to cook the beans and in which they rested until you opened the can. 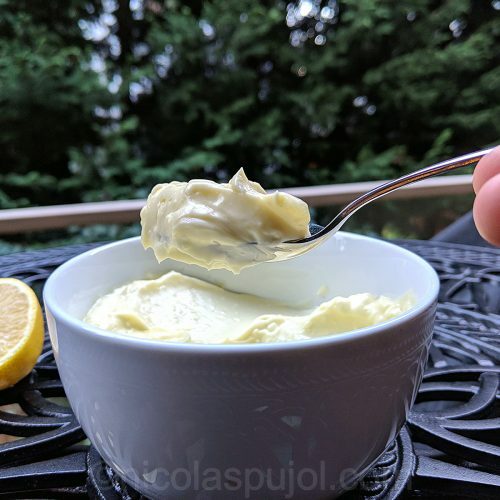 Aquafaba is essentially garbanzo bean residue in water suspension, and it makes an outstanding vegan egg replacement. You can pair aioli with red radish, celeri, carrot, avocado, potato (think sweet potato fries with this sauce), and of course, meat, fish, and so on. 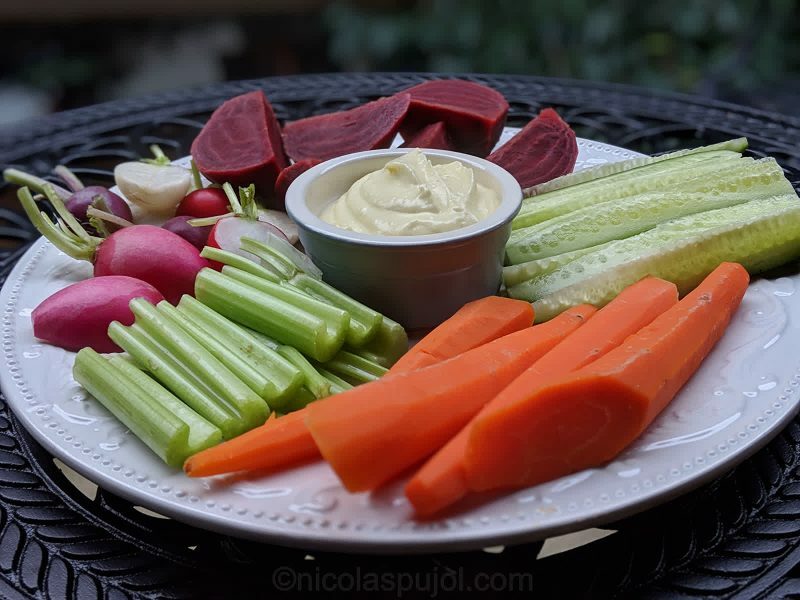 Here is a recipe for a vegetable platter to go with it. Even bread makes a great appetizer for dipping. A variation from the traditional aioli by hand or using a blender, this vegan aioli sauce uses no egg, using aquafaba, and tastes as good as the original. 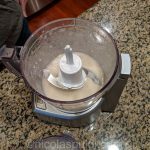 In a food processor or blender, mix the aquafaba with salt and garlic. Combine the avocado and olive oil into one cup. Add oil very slowly at the beginning. Blend. Then add 1-2 tbsp oil. Blend again. 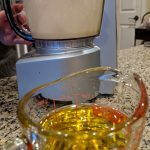 Add oil, blend again, and so on. 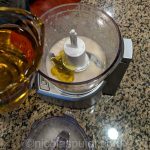 Only half way through the volume of oil, you can add gradually higher amounts at each step, to ensure the aioli solidifies and does not liquefy. At the final additional, add the lemon juice and last bit of oil.